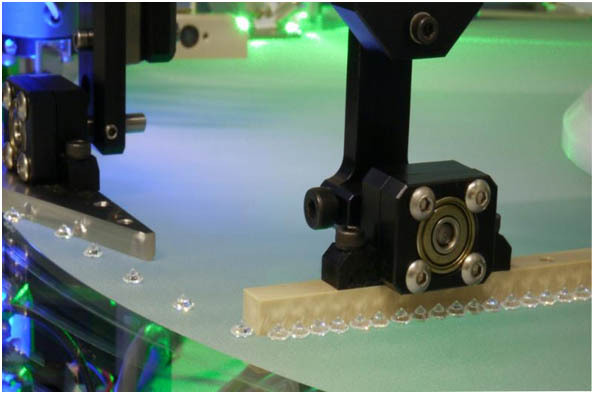 The Swiss Gemmological Institute SSEF has announced the release for international export of an upgraded version of its Automated Spectral Diamond Inspection (ASDI) device. The system is designed to support the diamond industry against the threat of small synthetic diamonds mixed into parcels of natural colourless melée diamonds. ASDI is able to conclusively identify colourless natural diamonds, by sorting out both HPHT and CVD colourless synthetic diamonds, as well any colourless HPHT-treated diamonds that may be included in a parcel. It is the only automated system that can examine large numbers of stones of colourless melee, as small as 1 millimetre in diameter or 0.4 points in size, at high speed and at low cost. The ASDI device is being marketed and distributed worldwide by SATT Gems SA, which was established in 2014 specifically for that purpose by SSEF, a worldwide authority in gem testing. With a unique capability of being able to sort diamonds by size with high precision, and at the same time authenticate each diamond's natural origin, the ASDI has been tested with millions of melée-sized stones, ever since a prototype was first released in 2013. Sorting at an average speed of 4,000 stones per hour, the system is robustly constructed, adapting it perfectly for industrial environments. The new upgraded version has also been provided an automated symmetry and proportion grading function. There currently are five ASDI instruments being used on a daily basis. Two are being operated by diamond trading companies in Switzerland, two by leading Swiss watchmaking groups and one by a diamond-grading laboratory. Members of the Indian industry will have the opportunity of learning more about the ASDI at the DDES Diamond Detection Expo and Symposium in Mumbai, from December 14 to 16. "The challenge that the entire diamond industry faces from undisclosed synthetic diamonds requires an industrial solution, and that is what we have developed," said Jean-Pierre Chalain, Director of the Diamond Department at SSEF and Head of ASDI Development at SATT Gems, who will be a speaker and panellist at DDES. "I am honoured to be invited to present the ASDI to the Indian diamond industry."